Welcome to the sixth and final post in my W.I.N. block series! I hope the first five have been helpful in getting you inspired and organized to start a W.I.N. block in your own classroom. W.I.N. which stands for What I Need is a time during your class schedule that is set aside for the purpose of meeting individual student needs. During this time you are providing students with intervention, engagement, and/or enrichment activities and instruction based on each student's need. In the previous five posts I explained and gave ideas for what W.I.N. 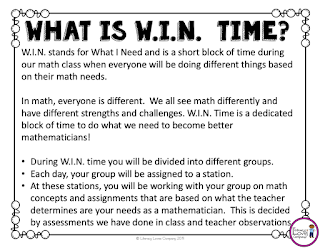 time is, organizing student groups, planning for station activities, managing station and teacher materials, and keeping kids accountable during their W.I.N. time. Today I am going to share with you some ideas and some insight into how I launched my W.I.N. block with my math class. Stations with appropriate activities are ready. Your "Teacher Time" lessons are prepared. Student folders are prepped and at the station they are assigned to the first day. 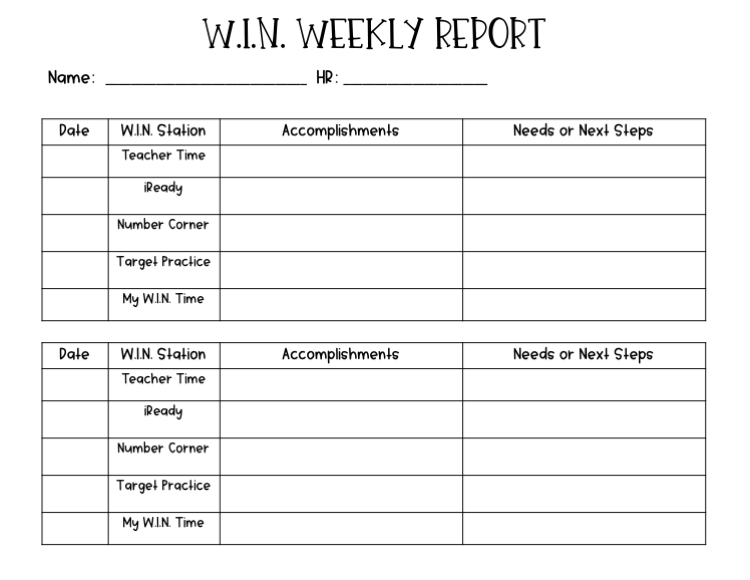 Student "Weekly W.I.N. Reports or Trackers" are printed and ready. Your W.I.N. Block board is up and student groups and other information are posted. 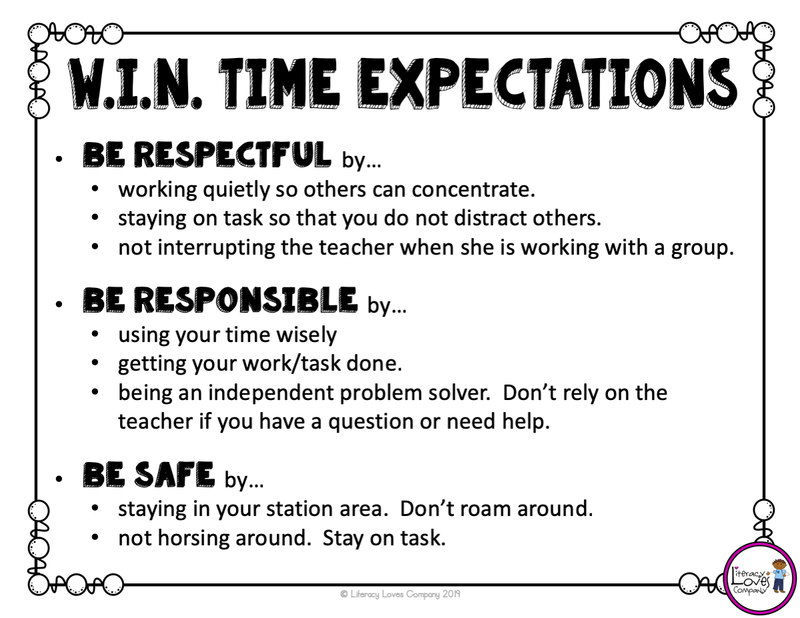 Know what your signal will be to let students know W.I.N. time is over. I use a small chime. On the first day of W.I.N., I gathered my students around the W.I.N. board. They were curious about the information and names on the board, so it was easy to keep their attention. I explained what W.I.N. time was and why we would be using a portion of our math time to participate in it. I have a diverse group of learners in my math class, so the idea of different activities and opportunities was exciting for them. My gifted learners were excited to be challenged in different ways and my struggling students knew that they would be practicing skills and concepts that would help them start to grasp the material we were working on. Both of these posters are available to download on the first post in this series. After I had explained what W.I.N. time was, I went over the expectations for their work and behavior. On this first day, we did not actually do W.I.N. It was our practice day. After going over expectations, the students and I traveled from station to station as I explained each activity they would participate in. I have found that it is important to always locate each station in a specific location. 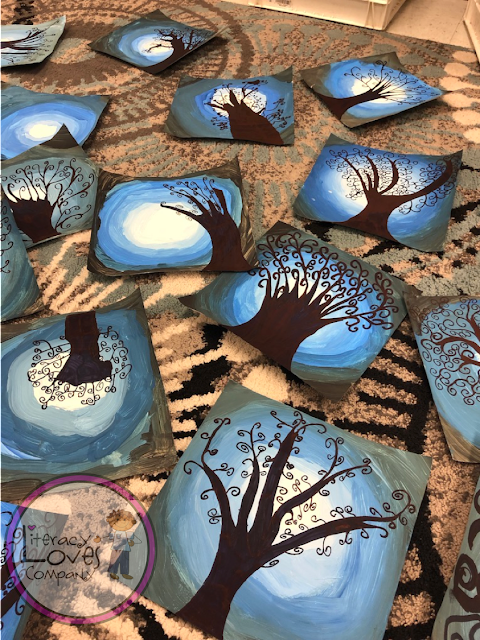 Student are then able to easily know that when they are assigned to "Teacher Time" they meet on the carpet, or if they are working on "Targeted Practice" they always meet at the round table. The more consistent you can be, the more smooth the transition into W.I.N. time will be for you and your students. It is important that students understand the plan for when they are at their station. 1. 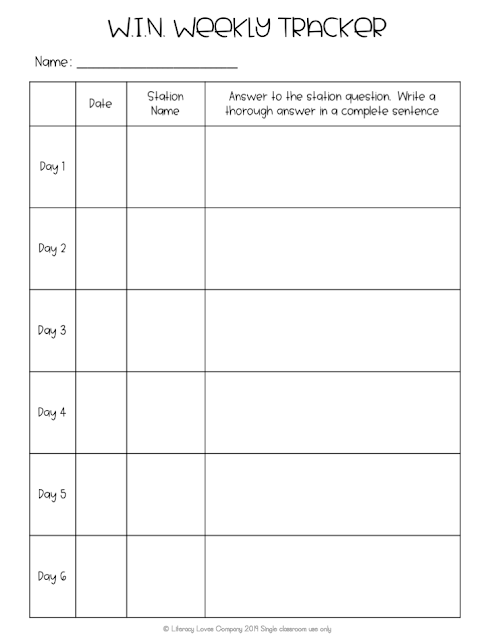 Students should read the directions for their activity and make sure everyone in the group is clear about what the expectation is. If you are using the Tracker, students should read and know what the question is that they will be answering at the end of their W.I.N. time. 2. Students should begin working on their task. 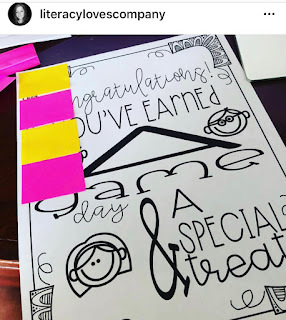 This might be a game, a worksheet, a computer task, or other activity. 3. There should be a plan for early finishers. What can they do? I have a bin of math picture books, multiplication practice sheets, flash cards, etc. for students to grab if they finish. Make sure to explain this to students. It would be a good idea to make a menu of what students can do and hang it on your W.I.N. board. 4. What should students do if they have a question or get stuck and you, the teacher, isn't available to help? Students should rely on each other and work together to be problem solvers. They should not interrupt the "Teacher Time" station unless it is an emergency. 5. At the end of time, when the signal is given, students will clean up their station so that it is ready for the next group. 6. 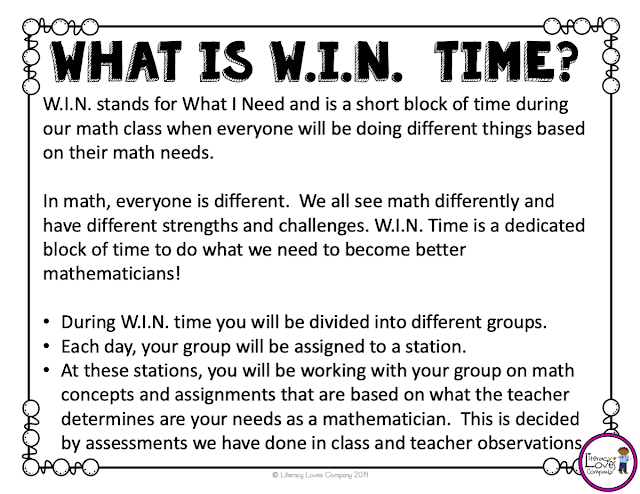 Students will answer their station question on their W.I.N. tracker and put it back in their folder. 8. All station bins should be put away. Make sure your students know where they should put the bins. On this first day, we did a practice run. I explained to students that we were going to "pretend" to do W.I.N. so that we were prepared to start it the next day. I compared it to having fire drills... we practice so we know what to do. My W.I.N. time is the first 30 minutes of my math block. I had students leave the room and then come in pretending like it was the beginning of class. Students came in, looked at the board, and then went to their stations. I monitored and helped students who were lost or didn't know what to do. Students went to their stations, got out the direction sheets and read the directions with their group members. Afterward, they pretended to do the work. This whole time I am walking around and helping students. After about 1 minute, I rang the signal bell. Students cleaned up their stations, and then pretended to write on their tracker. I rang the bell again and one student put the bin away. At the end of the practice, hold a question and answer session. If the practice didn't go smoothly, go over what the struggles were and clarify expectations once again. It is always okay to hold another practice session. The next day is the official start to W.I.N. time. Make sure that stations are out in their designated space. 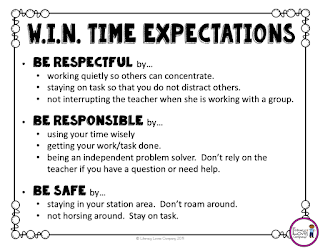 When students come in the door, remind them that today they will be doing W.I.N. time. Today you will be meeting with your "Teacher Time" group, so you will not be able to monitor your whole class the whole time, but I always keep an eye out for groups that are off task or students who look like they are unsure what to do. If this happens, I give my group a problem to work on, or a quick task to do like "Explain to a partner how to do this problem." then I quickly check in on the student or group in need of assistance. At the end of time and maybe a little early, give students the signal to clean up and write in their tracker. After all stations are cleaned up, ask students what went well today and what they have questions about. I would do this daily for the next week or so as students are getting use to this new classroom routine. It is important to listen to their questions and feedback. Always be aware of how your W.I.N. block is running. If there is something not quite working, don't be afraid to stop and adjust. My class was having a terrible time transitioning quietly into class and beginning W.I.N. time. This had been a problem all year, even before we started this new routine. To draw attention to the issue and to give students a challenge, I held a meeting with them. I explained my feelings on the problem and then introduced them to a quick incentive chart. 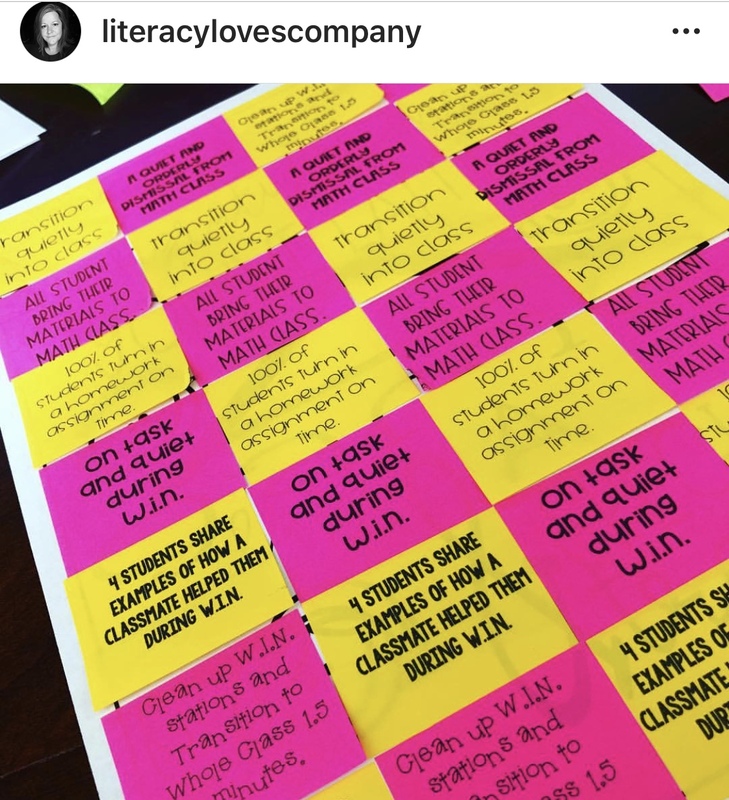 Follow Literacy Loves Company on Instagram and Facebook where I share more of my everyday classroom ideas! When I introduced it, the prize was covered. At the end of each day, we discussed our goals and then, if they had reached the goal, we would take the sticky notes off of the sheet. Little by little the prize was revealed. It was intriguing to the students and a fun way for students to work on transitioning and staying on task. In order for your W.I.N. time to run smoothly, it is important to spend the time at the beginning setting up the routine, explaining the expectations, and practicing. Well, that's it! As you start your own W.I.N. time, remember to be flexible. Sometimes things don't work out the way you planned and you need to be willing to make changes. Once you get the kinks ironed out and the students trained on the routine, the time you've put aside to give students what they need will be worth every minute! 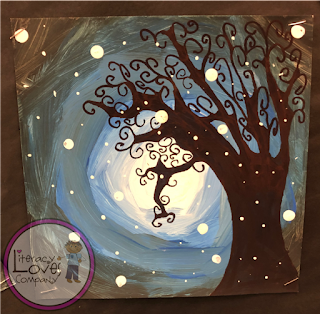 Thank you for visiting Literacy Loves Company and following along as I shared my experience and advice for setting up a W.I.N. time in your classroom. Please be sure to check out the previous posts and get the free downloads. 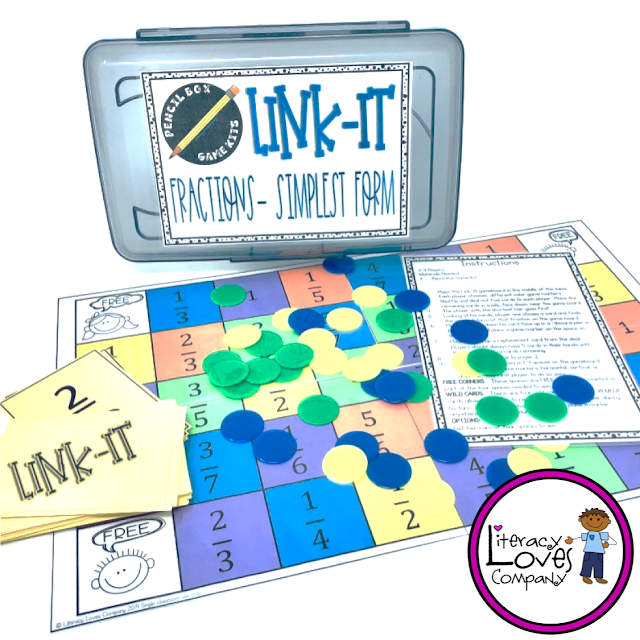 Below you will find some links to FREE math station activities from my TeachersPayTeachers store. Students construct and solve subtraction equations to beat their opponents to the finish line! Practice with number lines and tape diagrams. A plethora of advice and links to free resources from TpT sellers. 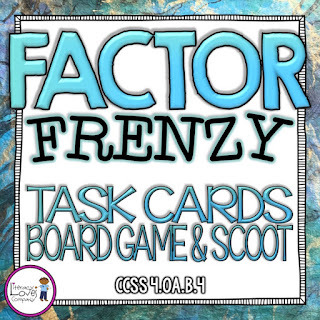 Several options for practicing factors in a math station. 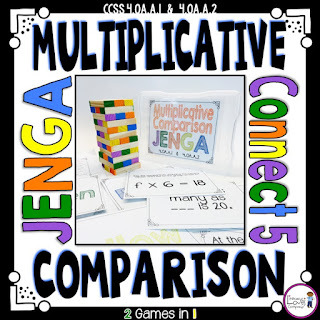 Working with multiplicative comparisons in a fun "Jenga" inspired game! 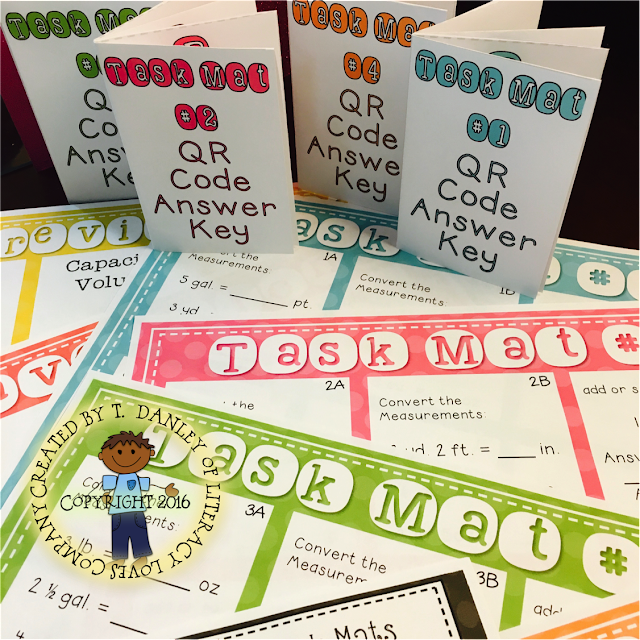 Measurement task mats with QR code self-check answer keys. To see all Literacy Loves Company math resource click HERE. Labels: freebie, math, math workshop, Teachers Pay Teachers, TpT, W.I.N. Happy Sunday Afternoon! I'm sitting here in my living room looking out at the beautiful February sunshine. The funny thing is, this weekend we were forecasted to have the snowstorm to end all snowstorms... grocery stores were rampaged. Gas station lines were miles long. Teachers and students alike were prepping for snow days this week. It's now Sunday and I am looking out at bare ground and glorious sunshine. I'm not sure if I should be disappointed or relieved. 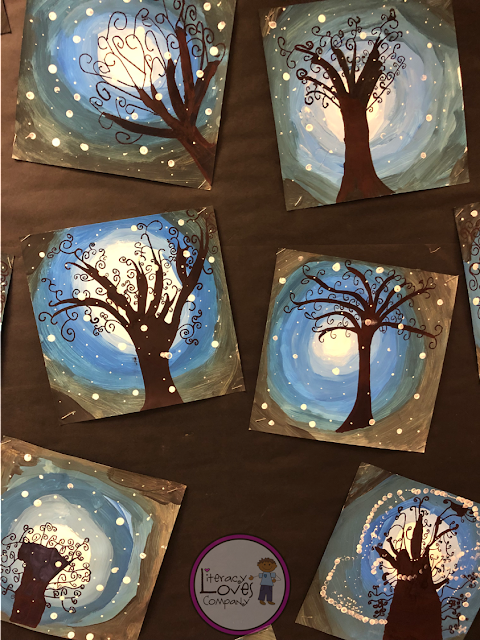 As a type of precursor to this "snowpocolypse", my students completed their snowy tree art project this week and we finally got them on display. They turned out beautifully... each one is unique and the whole display is magical! I often get my inspiration for classroom art from the internet. While searching for a winter project, I came upon a photo of a project similar to the one you see above. As I prepped for writing this post, I tried to search it out so that I could give the original poster credit and was unable to find it. 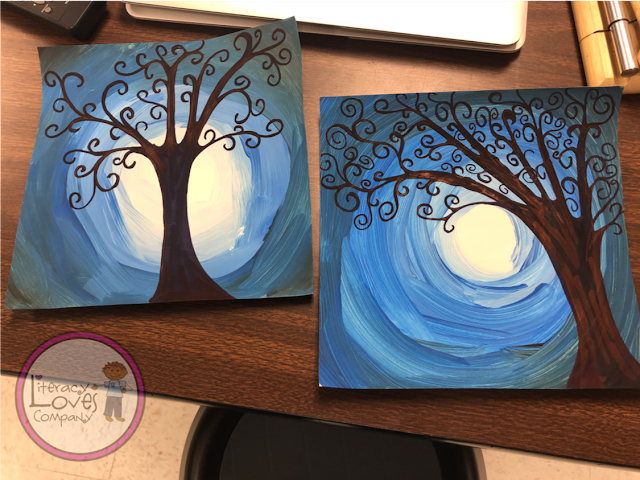 One of the things I love to do is find an original piece of art and try to figure out a way to make it accessible to my own students. This means determining which medium to use with our limited resources and the step-by-step order for the project since we have limited time. This project takes at least two sessions with drying time in between. I cut the paper into the squares. I put plates and paint brushes on each group table. On the plates I put a dollop of white, blue, and black paint. Students paint the background by painting a white circular shape in the middle of their paper. As students work out from the middle of the page, they mix blue into the edge of their white paint creating a light blue. As they work out toward the edge of the paper, they continue to add blue until they are using pure blue. At that point they start to add black to their blue to darken it and continue to work out until they work their way off of the page. Many of my students went back in with white, after cleaning their brush, to smoothed out and widen the middle circle. We stopped at this point, cleaned up, and let the paintings dry. Once the painting dry (later that day or days later) hand out the paintings, Sharpie markers, and bold tip permanent markers. I demonstrated for my students, under the document camera, how to draw the curvy branches and fill in the trunk. When I did this for my students, I modeled directly on the painted background. 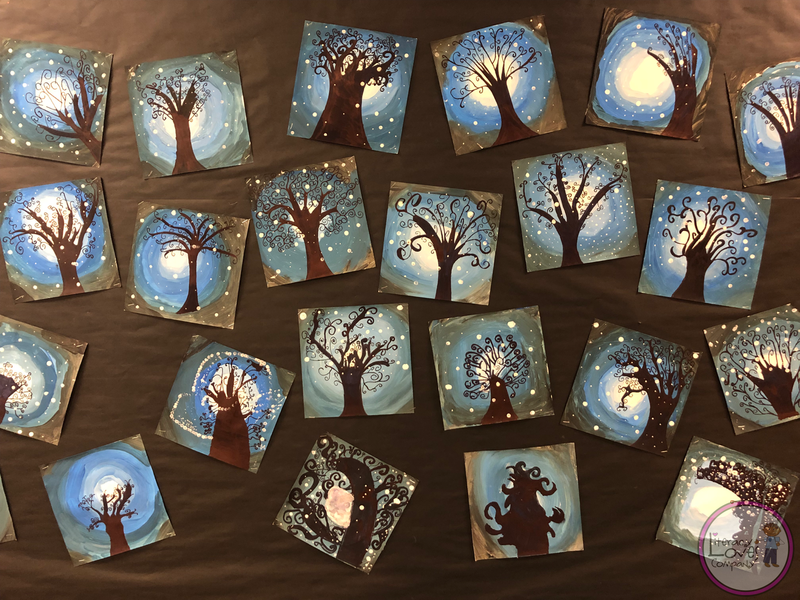 The background was a bit more rough so students had to work more carefully. Some students positioned their trees in the center of the page and others off to the side. Both are beautiful! The final step is to put "snowflakes" on the page. provide one dollop of white paint for each group of about 4 students. I happen to have corndog sticks that we used to make the tiny dots (pointed end) and the large dots (blunt end). You could also use small dowels, toothpicks, the handle end of paintbrushes, etc. The goal is to make sure the dots are random around the page. The results were magical! 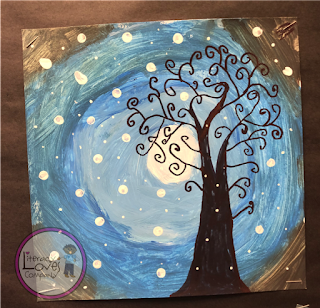 Every tree turned out just as unique as the artist who painted it. I hope that this post has inspired you to create some magical winter trees with your students. If you do, please share your pictures on Facebook and/or Instagram and tag LiteracyLovesCompany. I'd love to see your beautiful pieces of art. One of the keys to success for incorporating a W.I.N. 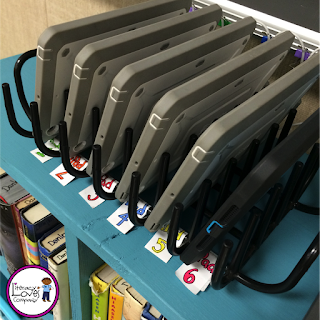 block into your classroom routine is organization. While implementing W.I.N. 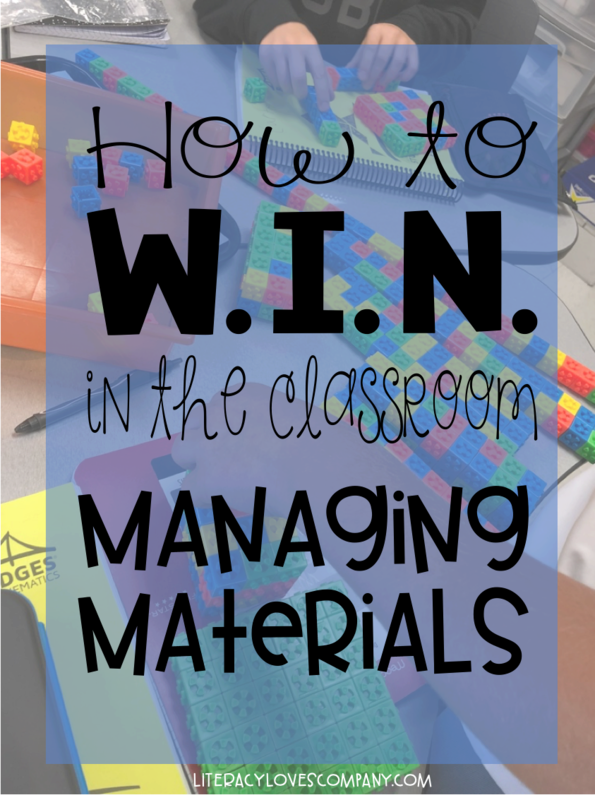 in my own classroom I have found that there are three main organizational areas: student materials, station materials, and teacher materials. Each of my students has a red pocket folder that follows them from station to station. Of course, you don't have to have RED folders, that is just the color I had on hand. I would suggest, however, that all of your folders are the same color. This makes it easier to locate them and rotate them to the different groups. On the front of each folder, I have written W.I.N. block and the student's name. Students keep their W.I.N. Weekly Report and other station materials inside. I also have a file folder for each student. I would suggest using a different color than the pocket folders. I happen to have had red file folders also, and because I used red for both it has been a little more challenging to sort out the folders. This folder stays with the "Targeted Practice" station. At this station, students each have a worksheet or task that is differentiated for them. When planning for my W.I.N. 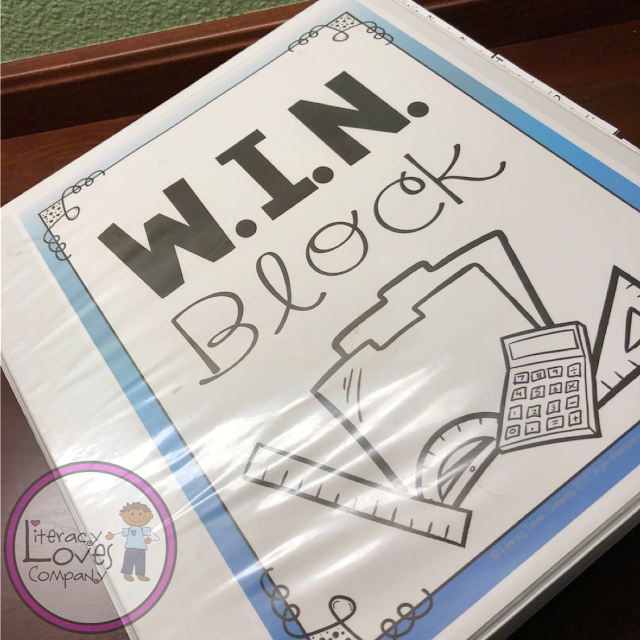 block, I place each student's sheet in that folder. When they get to the Targeted Practice station during our 6 day rotation, their sheet is inside that folder and waiting for them. If a student doesn't finish the worksheet, it stays in their file folder. When it is finished, they turn it in to a "Turn In" manila envelope specifically for that worksheet. 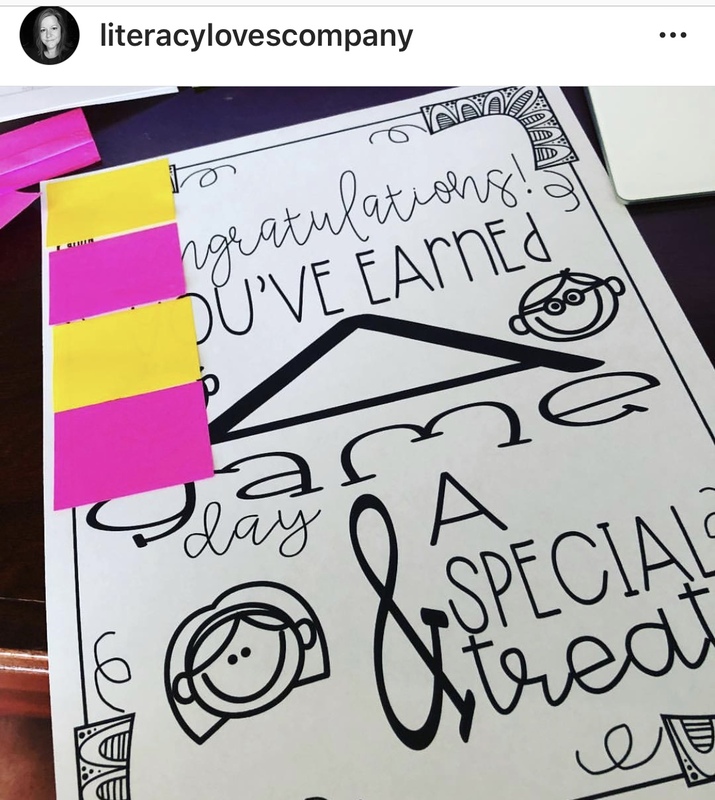 I collect the manila envelope at the end of the 6 day rotation and check through the work to see who finished and to check accuracy on the work. I include "Turn in" envelopes at any station that has written work that should be collected. 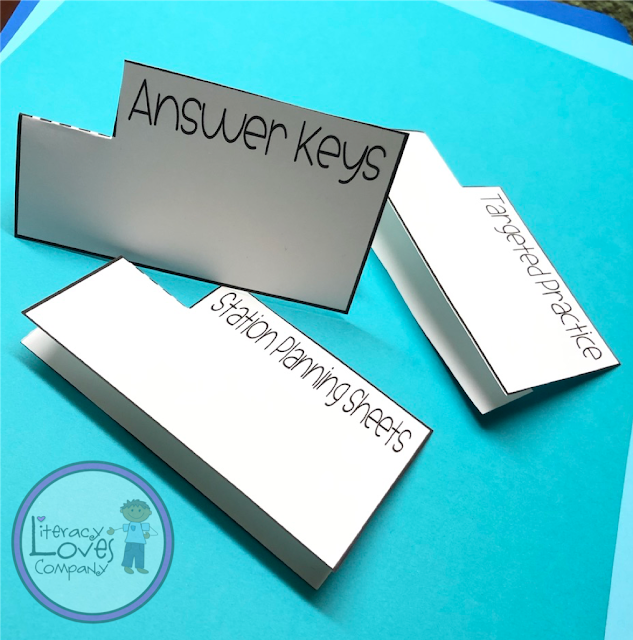 This isn't anything fancy, I usually just tape an index card with the name of the worksheet or task on the outside so that I can reuse the envelope the next round of stations. In the pictures, you might notice the station signs. I have found that they aren't really necessary since the materials bin acts as the station sign. I have found that in order to successfully stay on top of my W.I.N. 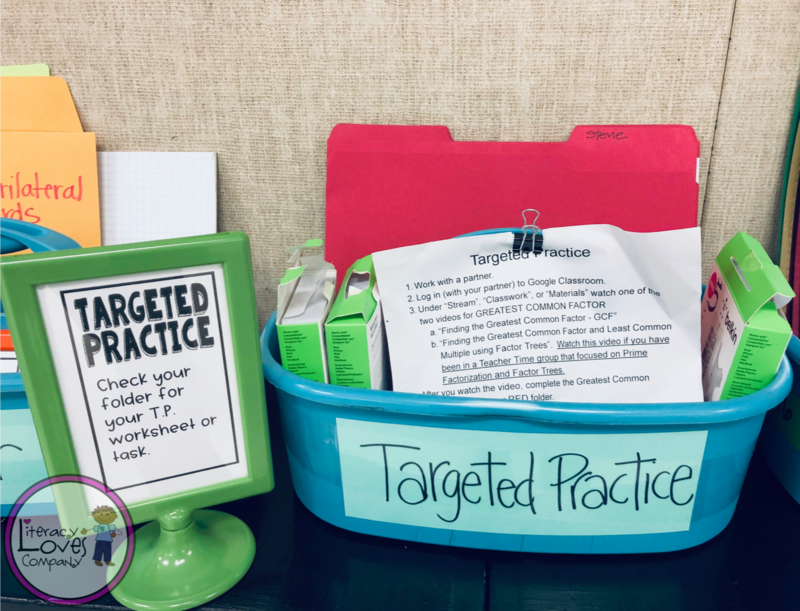 stations, it is important that each station has a bin, basket, or tub that is clearly labeled with the station name and includes ALL of the materials students would need to complete the tasks. Because of a limited amount of time for our W.I.N. 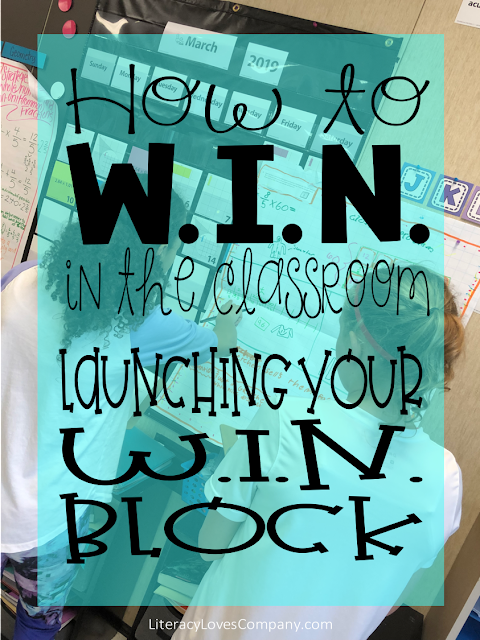 block, I want my students to be able to sit down at their station and have everything they need right there for them to get started. It doesn't really matter what type of container you use, but if you are able to, it would be helpful if they are all the same style/color so that students easily know that they are for W.I.N. block. In each station tub, I include the directions for the task, any worksheets that students may need, rulers, markers, etc. For my game station, if the game has a sheet that needs to be written on, I put four copies of the game in sheet protectors and provide whiteboard markers and erasers. This saves on copies. One thing you may not know about me, or maybe you do if you have read some of my other blog posts, is that I can be a jump-in-with-two-feet kind of person. I usually dive right in and figure out the logistics later. The logistics of organizing my teacher materials was the area I put off the longest. When I first started, I kept everything in a pocket folder. This worked okay for awhile, but it became difficult for me to find my answer keys, last round's student grouping information, etc. While writing this block series, I've been working on getting more organized in this area. Now I am keeping myself organized by using a binder. Not surprising, I know. In my binder, I have sections for my W.I.N. 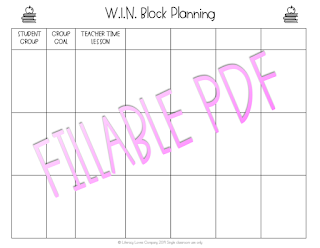 Block Planning Sheets (Free download available on linked blog post. ), answer keys, and targeted skills pages. 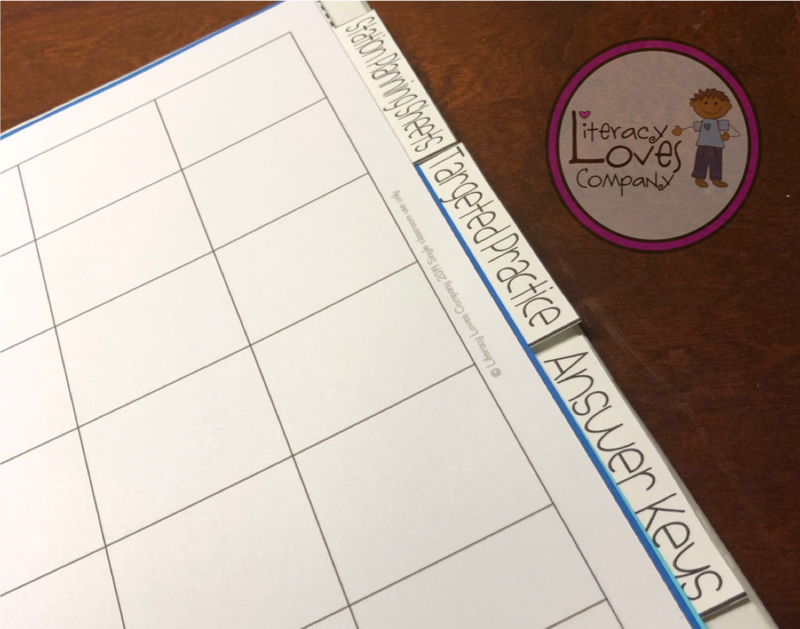 Using the binder, I can keep track of future skills I want my students to work on, data for future groupings, and the answer keys for the worksheets and tasks I am having my groups work on. I'm sure this is going to work out much better than my previous pocket folder did! As a gift for visiting Literacy Loves Company and joining me on this W.I.N. blog post journey, I've created a binder cover, spines, and tabs and am sharing them with you. Included in the download is the color version you see here and also a black and white version. 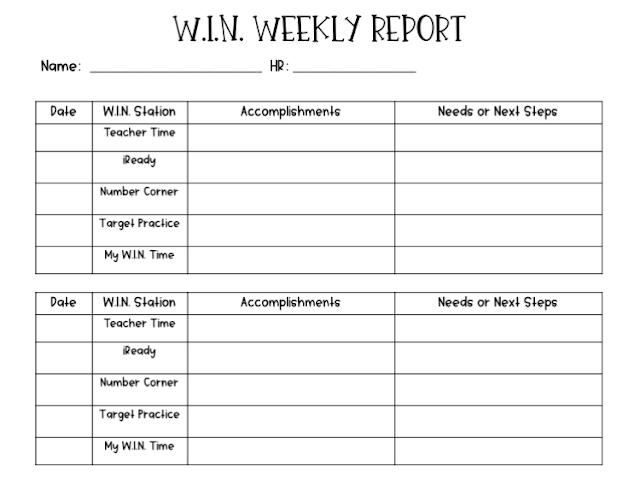 I hope you will continue to visit over the next couple of weeks as I finish off the series with information on how I keep my students accountable for their work during W.I.N. time. My final post on this subject will be some advice on how to bring it all together into a successful routine for both you and your students! If you have any questions or suggestions for managing materials for math stations or a W.I.N. block, please comment below! I would love to hear from you. Labels: classroom, classroom management, classroom organization, classroom supplies, differentiation, elementary, freebie, math, math workshop, Teaching Tips, W.I.N. 1. Does the activity meet students' needs in the area we are working on? 2. Is the activity fun yet rigorous? 3. 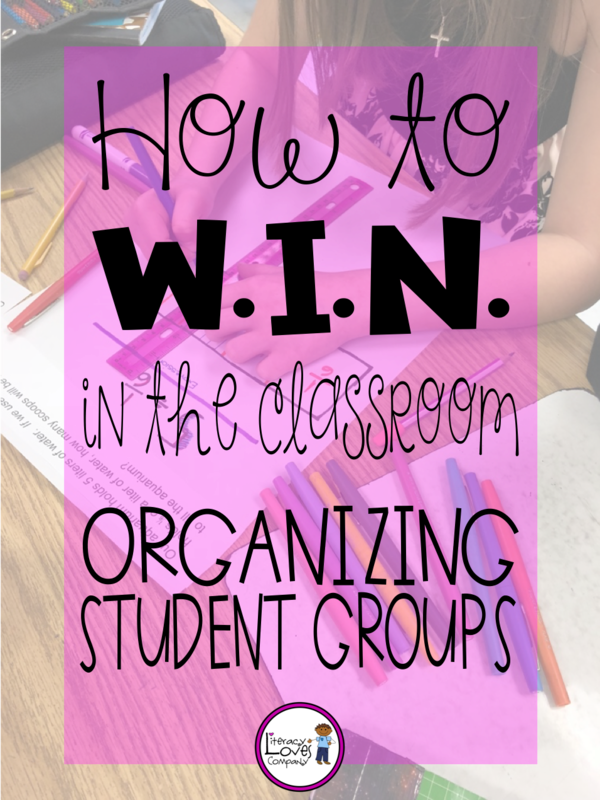 Is the activity easy to organize, understand, and clean up so that students are able to work at it independently? This is going to look very different depending on what grade you teach. In my class I run five to six math stations at a time, depending on how many student groups I have. 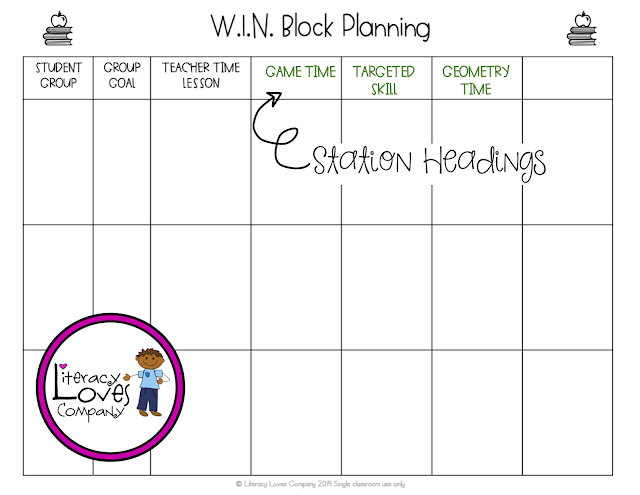 As mentioned in the second post in this series, I always start my planning with the Teacher Time station. I've heard this station called many things, but it is basically the station in which you, the teacher, meet with a small group of students for direct instruction. The focus should be whatever caused you, while looking at your data, to group these students together. I am currently scoring a set of post assessments for my math students. While I am looking over their papers, I am keeping a list of students who struggled in each of the areas covered on the test. When I plan for my next round of stations, I will group my students based on the needs I noticed and focus my lesson on that skill, strategy, or concept. During Tech Time, my students work on iReady. This is software that provides students with individualized lessons and practice based on a beginning of the year diagnostic. My school is lucky to have this resource, and I know that not all schools do. There are several free online math resources that are available for students. Some examples are MobyMax and Khan Academy Two game based websites are Prodigy and Skoolbo. I have used MobyMax, Khan Academy, and Prodigy in my own classroom. My students LOVE prodigy and will even ask to stay in at recess to play it. Because my school uses the Bridges curriculum, it comes with another component called Number Corner. It is probably similar to a calendar time you would see in a primary classroom. I have never taught primary, so I'm hoping this is an accurate assumption. During number corner, students are working on finding patterns on calendar markers, working with problem solving and computation, fact fluency, and measurement among other things. Game time is a great opportunity to focus students on different skills and concepts. Games can be geared toward what you are working on in class or you can easily differentiate for each group that comes to that station. For example, my students just finished a unit on fractions. 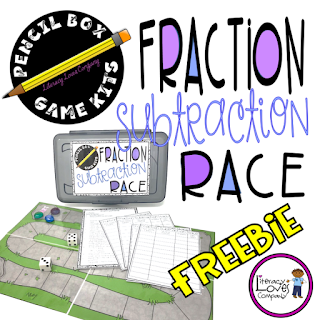 After looking through their assessments and organizing groups, I can easily have game kits ready for groups who are working on adding fractions, another for students who need review with equivalent fractions, and still another for students who are struggled with common denominators. Pencil Box Game Kits available @ Literacy Loves Company on TpT. Click on Pic for more information. There is always a skill I would like my students to get more practice with. During this station, I focus on one skill and then differentiate within that skill. This is one of the few stations that I use worksheets in. 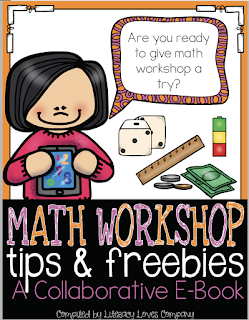 At the beginning of the school year I invested in a subscription to Math Worksheets 4 Kids. I have found this website to be very helpful. I am able to look up worksheets my concept and then find worksheets by level. Another great website is commoncoresheets.com . Other options for this station are task cards or task mats. If you can find ones that are self-check, that is a bonus! 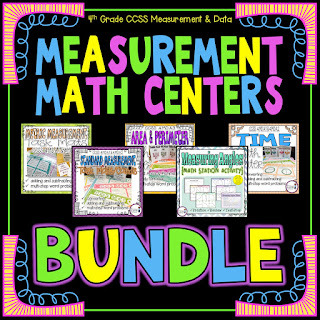 Measurement Task Mats available @ Literacy Loves Company on TpT. Click on pic for more information. Geometry seems to always be the last unit of the curriculum and the hardest to get to. Because of this, I have a geometry station. 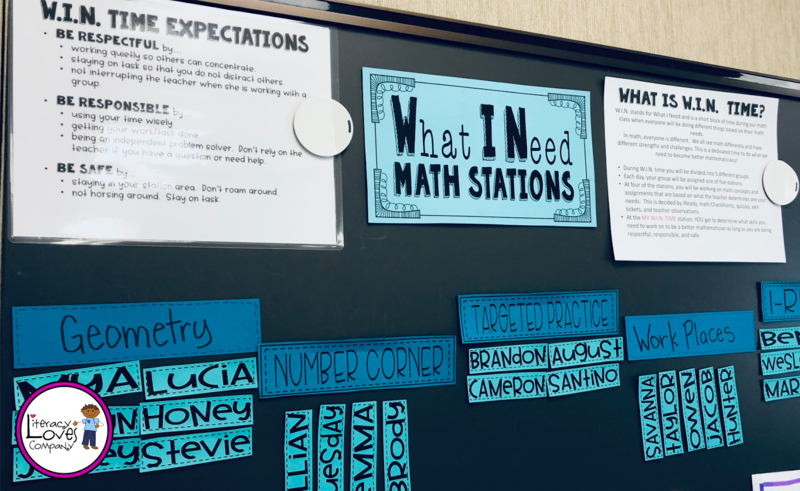 I use my math curriculum and the state standards to guide this station. My goal is to give students an opportunity to work with these concepts before state testing in May. Fact Fluency - Practice math facts - This station would be easy to differentiate as student work on the facts they have yet to master. This station could be as easy as flash cards and timers as student work to be able to quickly recall their math facts. 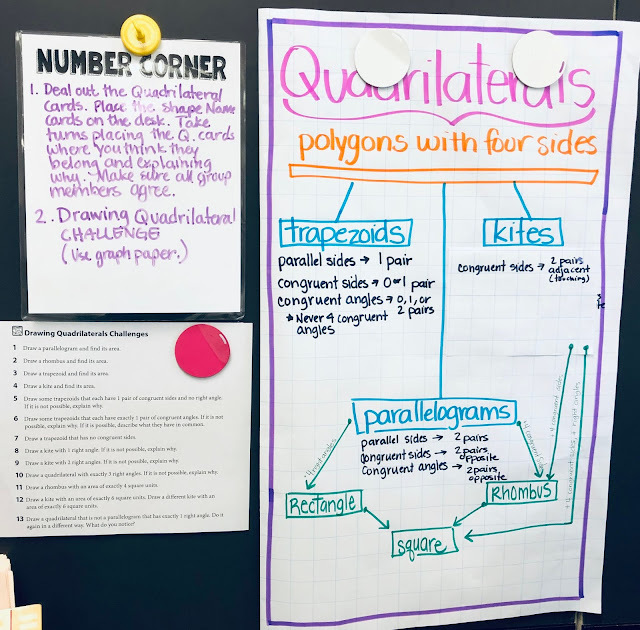 Mathematical Picture Books - Sometimes reading a picture book based on a math concept can be a great way for students to connect. There are a lot of wonderful picture books available depending on what you are focusing on in class. 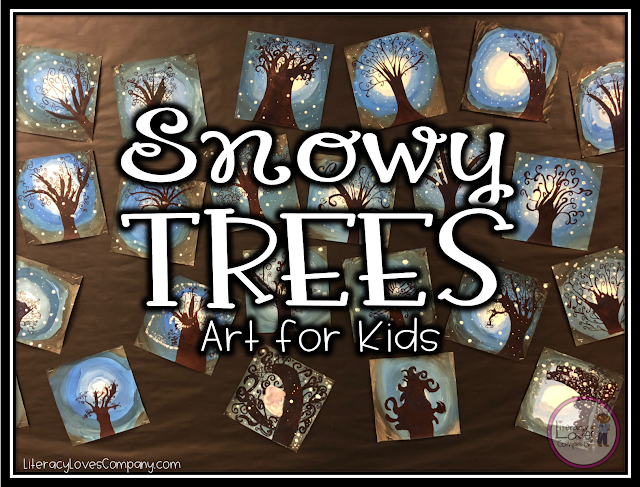 For this station, you could have a picture book focusing on the concept you are teaching in class. Inside the book, you could ask discussion questions on sticky-notes strategically placed throughout the book. As students read, they stop to answer and discuss your question. Depending on the book, you could add an extension task. 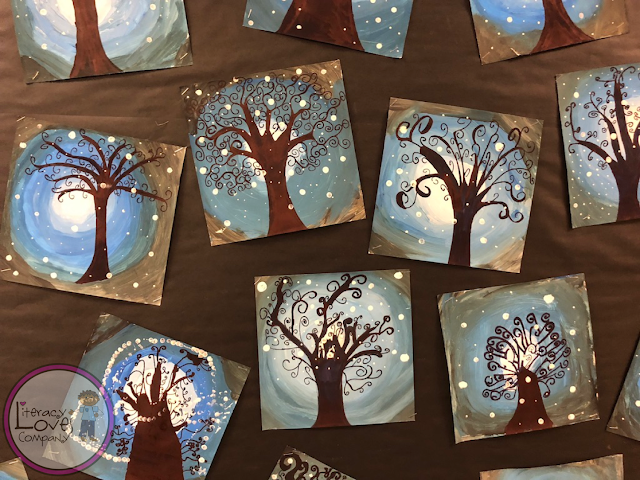 Math Art - Integrating art into your math stations can really motivate students to participate. 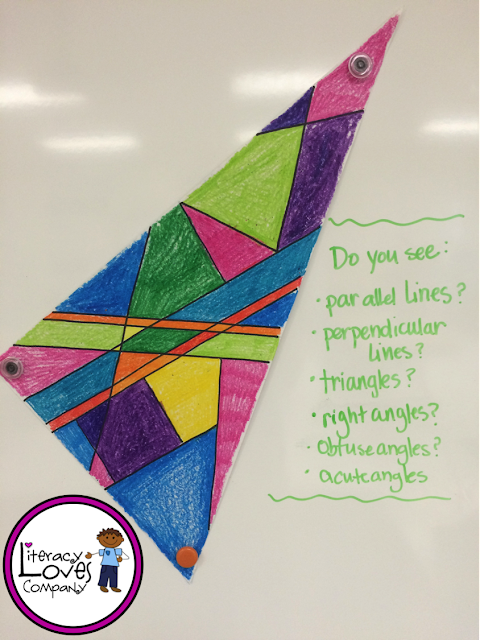 When working with area, symmetry, plane figures, angles, and more. The activity featured below is from a blog post I wrote a few years ago. 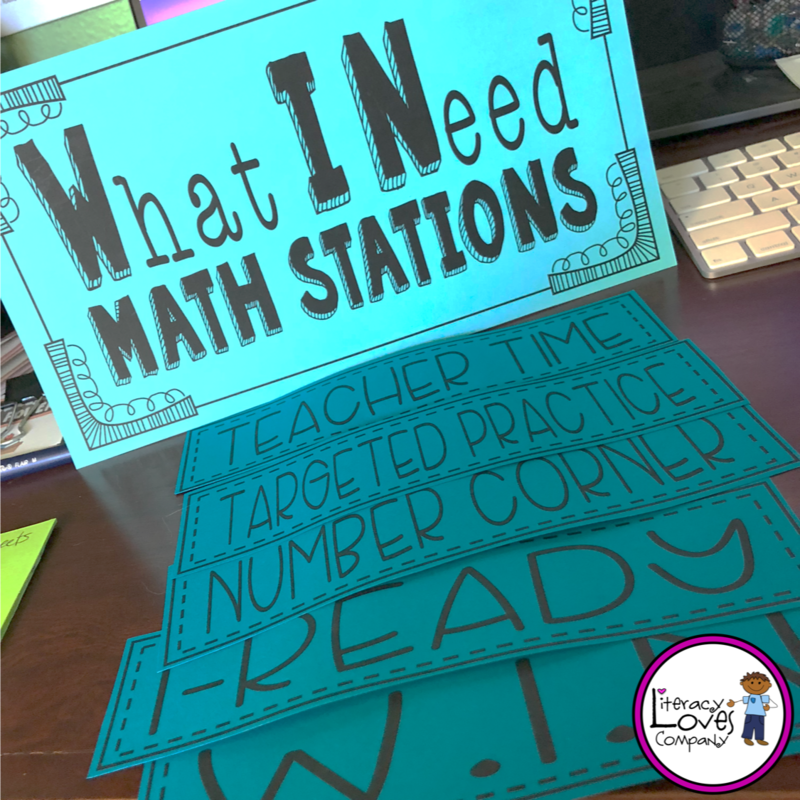 As you can see, there are MANY ways you can support students in stations during your W.I.N. block. 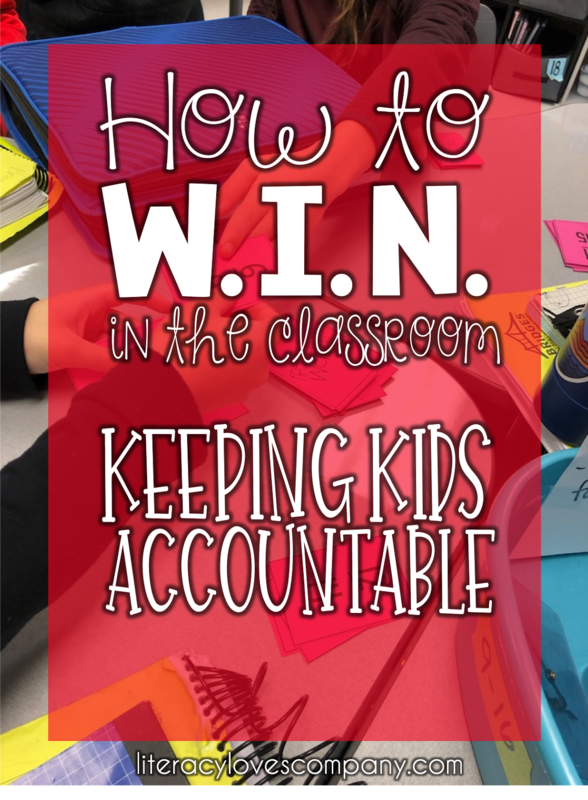 The thing to keep in mind is that whatever task you are asking your students to participate in, it is one that will move them forward and help them be successful. 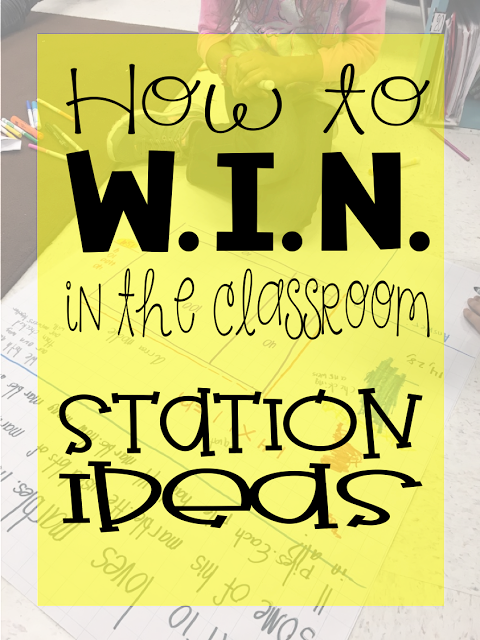 Once you decide on what stations would best benefit your students, try to find a space on a classroom wall, blackboard, or whiteboard to host your W.I.N. Station rotation board. This is the area you will post your station signs and student names. Click below for a free download of the station headers and sign. There are two options: Google Slideshow which is easily editable or PNGs which can be printed as is or placed in a PowerPoint slideshow and edited. I have my W.I.N. board located on a blackboard. My signs all have magnetic tape on the back which makes it easy to move. At the end of each day, I move my station headers to the left, rather than move the student names. As you can see, coming up with ideas for your W.I.N. stations isn't difficult! There are a plethora of options available to you. 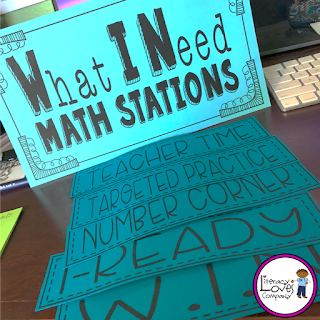 If you have a great idea for a math station that wasn't mentioned in this post, please share it in the comments below. 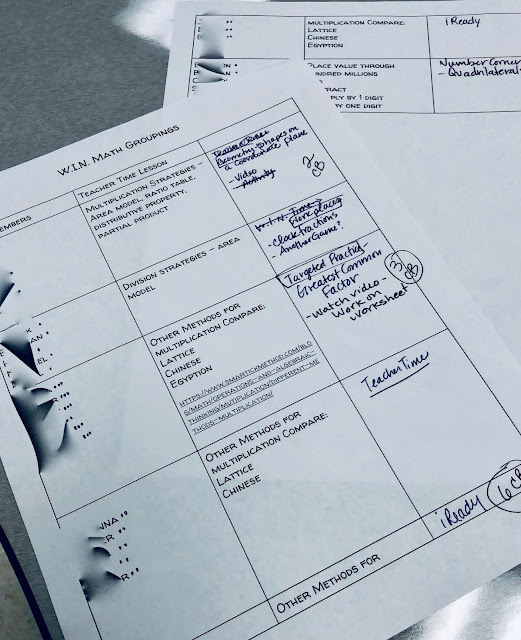 In my next post in this series, I will be sharing with you ideas for organizing and managing your teacher paperwork and your station materials. 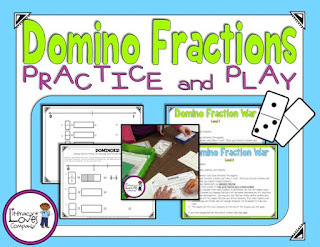 Domino Fractions FREEBIE. Click on image. I'm always adding products, free and paid, so please follow Literacy Loves Company on TpT so that you get notification. I price all of my newly added paid resources at 50% of for 48 hours, so it is a great way to save money. Thanks for visiting Literacy Loves Company! Labels: art integration, freebie, geometry, math workshop, Teachers Pay Teachers, Teaching Tips, Technology in the classroom, W.I.N. In the first post of this series, I introduced you to the W.I.N. block. W.I.N. stands for "What I Need" and as the name implies, the thing that makes a W.I.N. block a different than most workshop or center time models is the focus on individual student needs. 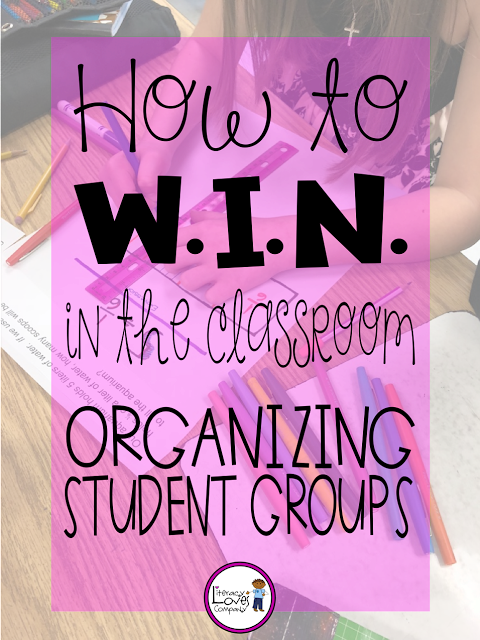 Before we look at grouping students, let's talk about a couple of decisions that need to be made before you start organizing your groups. 1. When, in my schedule, can I fit a W.I.N. block? In my case, I have a 75 minute block for math. I chose to use the first 30 minutes of that time. There are some teachers in my school who hold a W.I.N. time the last 30 minutes of their math block. 2. How often will students participate in the W.I.N. block? My class has W.I.N. time every day. Students come into the classroom and go straight to their stations. One of my teammates hold a W.I.N. block twice a week. Really, it just depends on your schedule and what you hope to accomplish in that time. The first few rounds of W.I.N. in my classroom were 5 days long. I organized my students into 5 groups based on assessments I'll discuss a little later. I chose 5 groups because I had five stations, so each group would complete all 5 stations in five days. After the first few full rounds, I realized that, if I am really trying to give students what they need for math, I can't always fit everyone into 5 groups. For the last two rounds of W.I.N. my students have been in 6 different groups. Because of this I planned 6 different stations. Speaking of organizing students into groups based on their needs, there are several different ways I gather data to inform my grouping decisions. At the beginning of the year, before you have any of your own data on a student, using the previous year's state reading and math assessments is a great place to start. My students participate in SBAC at the end of each year, so that data is available to help me get a better understanding of where each students is academically. Many teachers give beginning of the year assessments to their students. The results of those tests can give you some information on your students' needs and help you make decisions about student groupings. One assessment tool my district recently purchased for schools is iReady from Curriculum Associates. iReady is a comprehensive diagnostic test for both math and reading. Students take the assessment at the beginning of the year, the middle of the year, and at the end of the year. Based on their results, the software will group students. The software also gives teachers access to lessons and materials to help support students. 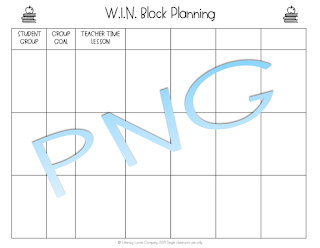 This is the first assessment tool I use to organize my intervention and enrichment groups for the W.I.N. block. I realize that not all school districts have the luxury of this diagnostic tool. Another assessment I use to organize my students is our math curriculum checkpoint quizzes or mid-unit quizzes. As I am checking over student work, I keep a list of the concepts covered in the checkpoint and write down the names of students who need extra support in those areas. I love grouping this way because it helps me support my students BEFORE the end of the chapter test. Exit tickets are another great way to quickly get a gauge for what your students need support with. Exit tickets can be purposefully created to help inform you BEFORE your next round of W.I.N. End of unit assessments are also helpful when putting together groups. Even though the chapter is over, it doesn't mean that all students have mastered the skills and concepts presented in those lessons. W.I.N. time is a great opportunity review concepts with small groups and give students more time and practice. These, of course, aren't the only tools you can use to gather data and form groups. The important thing is to know your students and have an understanding of what they need to successfully meet their academic goals. Once you have your data, find students who have similar needs and put them into groups together. I try to keep my groups to about 4 to 6 students. I have had groups that only had two students because those two students needed something much different than other students. When looking at student data, I usually have two or three groups that are working on holes they have in the concepts we are working on. I also usually have a couple groups that do not need intervention, but instead need to be challenged. When looking at student groups, I usually think of them based on the "Teacher Time" station. This is the station that students work directly with the teacher. I plan the lesson for each group based on why they were grouped together. The last round of W.I.N. that I planned, I worked with one group of students on multiplication strategies, another on division strategies, one group on basic operations, and three groups were being challenged to learn and compare three new multiplication strategies (lattice method, Egyptian method, and the Chinese method for multiplication) Those three groups had already mastered multi-digit multiplication and introducing them to three new strategies was fun for them. Also... the challenge of trying to figure out why they worked got them thinking about place value. Once your groups are planned and you know what the goal is for each group. Plan your lessons. I've used the planning page above for my last couple of W.I.N. rounds. I've revamped it for this blog post and to help me plan my next round. The new planning pages give you space for your group lists, group goals, group lesson plans, and an opportunity to plan each of your other stations. After you open in Google, make sure to "download" it. 3. PNG to put into a PowerPoint slide and make your own text boxes. Use this option if you want to be able to change your font, colors, etc. If you have any questions about how to form groups please let me know in the comments below. Also, if you use different assessments or sources of data in your classroom, please share with others by commenting. I look forward to hearing from you. How to W.I.N. in the Classroom: What is W.I.N.? Everybody likes to be a winner, right? I've never met a person who preferred to lose. This is especially true in the classroom. Teachers want their students to be successful, to feel good about their progress and capabilities. The struggle here is that no two students are alike. Every child needs different support systems and strategies to help them along their path. Differentiation can be complicated and as good teachers, we are always searching for ways to reach students where they are and help them progress to where they need to be. This is where the idea of the W.I.N. block comes in. I first heard of W.I.N. when one of my teammates came back from a professional development workshop shared the basic idea behind W.I.N. W.I.N. 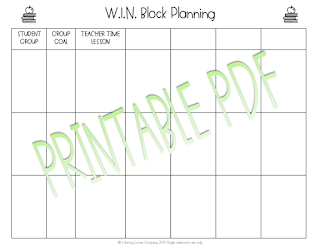 stands for What I Need and is a set block of intervention and enrichment time that students are in stations or activities geared toward their needs. I know this is nothing new. I've used the workshop model in my math class and literacy stations in my language arts, so I am familiar with the model. I think the thing that intrigued me about this version of an old idea was the emphasis on really understanding my students' needs and the challenge of finding ideas, activities, and materials to support them. Click to download a copy of this poster. You can incorporate a W.I.N. block for any subject. Right now I have a 30 minute W.I.N. block placed at the beginning of my math period. As we move into the new year, I am working on organizing a W.I.N. block for my fifth and sixth grade readers. W.I.N. 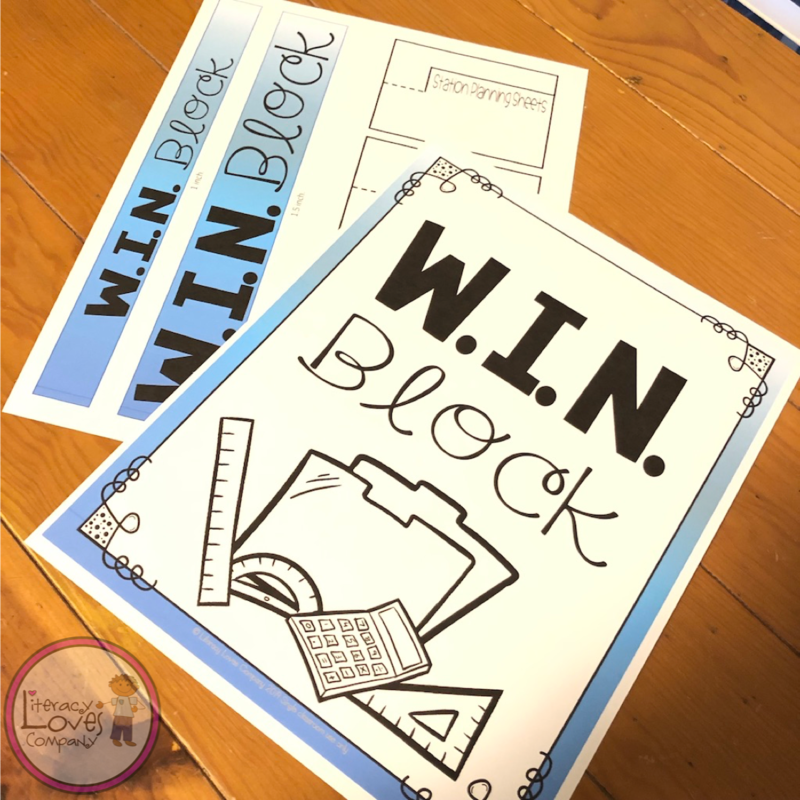 block can look different for different teachers. It really just depends on your students, your time constraints, your teaching style, and the expectations of your administration. 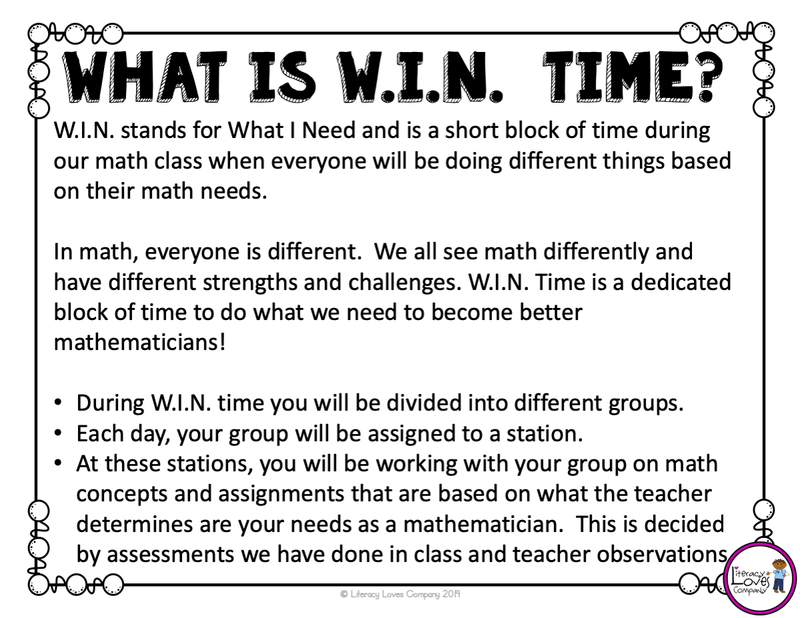 Several teachers in my building are incorporating some version of a W.I.N. block. None of them look the same and all are helping to give students what they need to be successful. 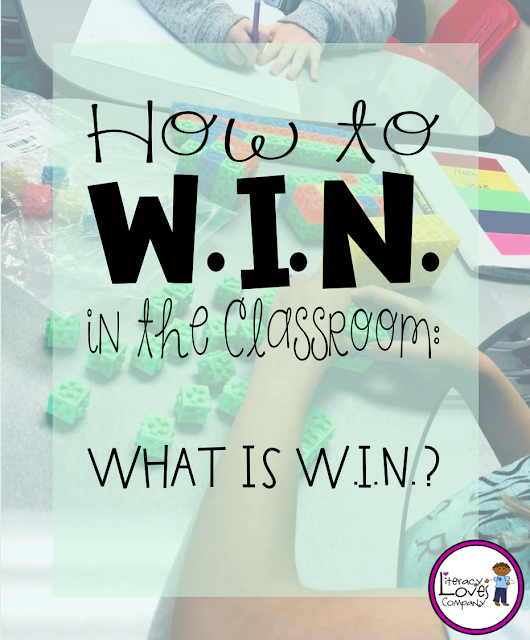 So, are you interested in W.I.N.ning in your classroom? The key to a successful W.I.N. block is organization. Organization of your student groups, organization of your stations, organization of your materials. If this seems like too much organization for you... I totally understand. You are a busy teacher. There is NEVER enough prep time! Maybe organization isn't your strong suit. Whatever the roadblock, I'm here to help! Over the next few weeks, I'll be continuing this topic in a series of blog posts. These blog posts will include downloads of free materials to support you on your W.I.N.ing journey! Next week I'll share with you what to consider as you are planning your student groups and what opportunities for assessment I use. I will also have available an organizational tool that helps me keep my groups and ideas organized. Until then, be thinking of a time in your schedule you might be able to fit in 20 -30 minutes of individualized time for your students. Also, If you have any questions about the W.I.N. block, please comment below. Thanks for visiting and I hope you'll come back again next week!